This box was created in the spirit of Dia de Los Muertos. 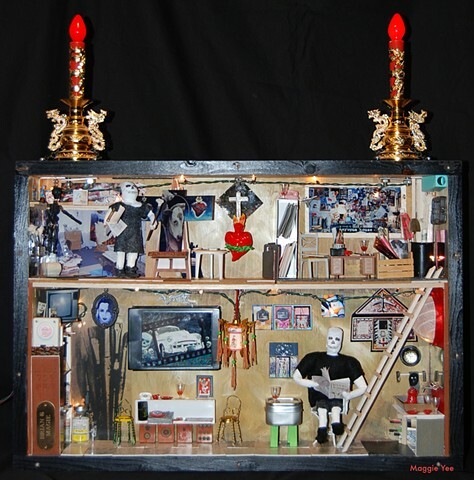 It was exhibited in Honolulu for a show called “The Day of the Dead, Not only for Mexico,” in 1996, held at the Coffee Time Cafe on Waialae Avenue. It is a box representing my life at the time with my husband, Brian. Downstairs is the living area and upstairs is the art studio. After spending several years in Hawaii, I carefully packed our possessions and art works. Then in the summer of 1998 we moved to Santa Cruz with only Brian employed. When I opened the moving boxes I found our fictitious home a mess. Just like our real life after moving. The furniture and accessories were tossed about, as well as the figures of me and Brian. I was splayed down on the floor on my back and Brian was on his head still sitting in the chair. It was hilarious to see a juxtaposition of the box and our life. I opened the assemblage box and tried to straighten up “our house” and studio. Years later in 2009 I decided to do a remodel, sort of updating the box to our current life. I brought in newer paintings, pictures of my grown children, a snapshot of my bulletin board from my real studio. I ripped up the felt carpet and laid down linoleum and added a few pieces of new furniture. I included a viewer in the top right corner to peek inside. It is the representation of a failed In vitro fertilization between Brian and I in 1997. Try to find a baby stuck in a medicine bottle. Well, I guess this box is a love story. We are still together till the Last Sunset wherever that may be.